At the grocery store this morning there was a special on blackberries. In January! So I bought 10 little packages, used one for a fruit salad at lunchtime, and converted the other 9 into blackberry jam. I used the recipe on the Certo package, but I probably had way more than 4 cups of crushed berries, so I added a little extra sugar but no additional pectin. There was a little more excitement than usual because I used a pot that was the perfect size if I'd used the right amounts of things, but with the extra berries and sugar, when I added the pectin it threatened to boil over. In fact it did boil over a little, but I managed not to get any on my skin. Contact with a substance the consistency of boiling tar is not really on my list of things to do. 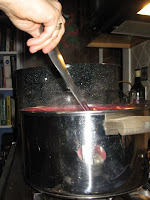 I held the ladle at the very end and stood as far back as possible for time it took to boil with the pectin. This photo demonstrates just how close it was! Instead of 8 cups as promised on the Certo instruction she et, I ended up with 11 1/2 cups. That's a good thing. 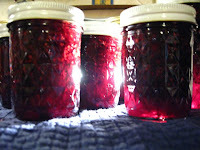 Considering how fast the raspberry jam disappears, I'm sure this won't last very long!